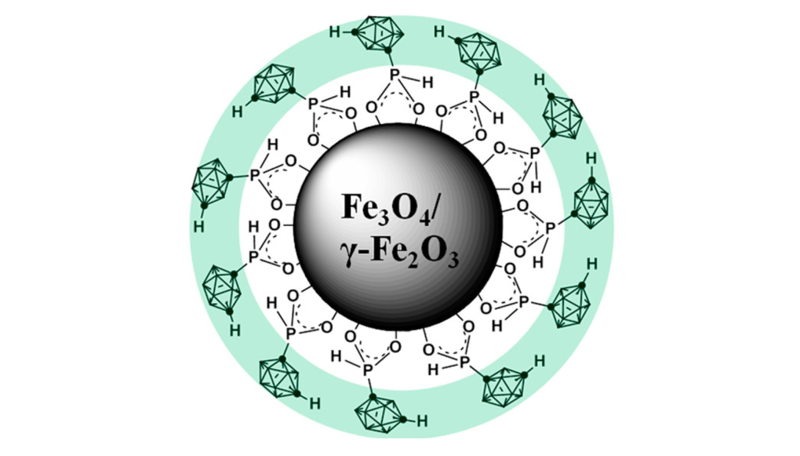 All-inorganic-made nanohybrid icosahedral boron cluster magnetic nanoparticles have been prepared. These magnetic nanoparticles (MNPs) consist of a magnetic core and an inorganic carboranylphosphinate shell. The phosphinate is directly bonded to the iron atoms of the surface in a bidentated coordination mode. The nanoparticles have been characterized by TEM, X-ray powder diffraction, infrared spectroscopy, energy dispersive X-ray analysis, high resolution X-ray photoelectron spectroscopy, magnetometry measurements, and redox titration, among other techniques. These studies have led to a composition (1-OPH(O)-1,7-closo-C2B10H11)8(2Fe3O4·Fe2O3)13 that implies a surface coverage of 61.3 ± 7.4% by the ligand. When these MNPs go through sterilization in one autoclave, the magnetic hysteresis studies suggest minimal change before and after sterilization; this could erroneously indicate that there have not been any changes in the MNP composition. However, the Fe2+ titration demonstrates that after sterilization only 1/7 of the Fe is Fe2+, leading to a core formula of Fe3O4·2Fe2O3 with a concomitant loss of ligand to a final ratio of 1:70 (carborane: Fe), and a final coverage by the ligand of 11.2 ± 1.4%. These studies bring relevant information on the behavior of the widely used MNPs and clearly show how the sterilization process needed for biological tests may alter the composition of the core and the loading of a peripheral ligand. In the particular case reported here, the liberated ligand has not been oxidized nor altered through the sterilization process.